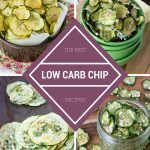 Sour Cream and Onion Cucumber Chips, light, low calorie, crispy, low carb and incredibly tasty! When I think how far I’ve come with changing my lifestyle to a sugar free one, I never thought I’d also have to exclude potato chips. And I didn’t for a long time. My thought was always, “They don’t contain sugar so I can still eat them!” And I was adamant and determined to “enjoy” them very infrequently, without a problem. Since I was probably about the age of 12 my greatest weakness has always been the potato chip. The grease. The salty bite. The comfort of it all. I’ve been leading a sugar free life for 11 years now. Yes it has changed over these years, revealing more and more things I need to remove in order to stay in control of my portions. Chips and I have never had a balanced relationship. I can’t eat just a serving, so I’ve eliminated them and don’t miss potato chips in any way. Surprised? Don’t be. 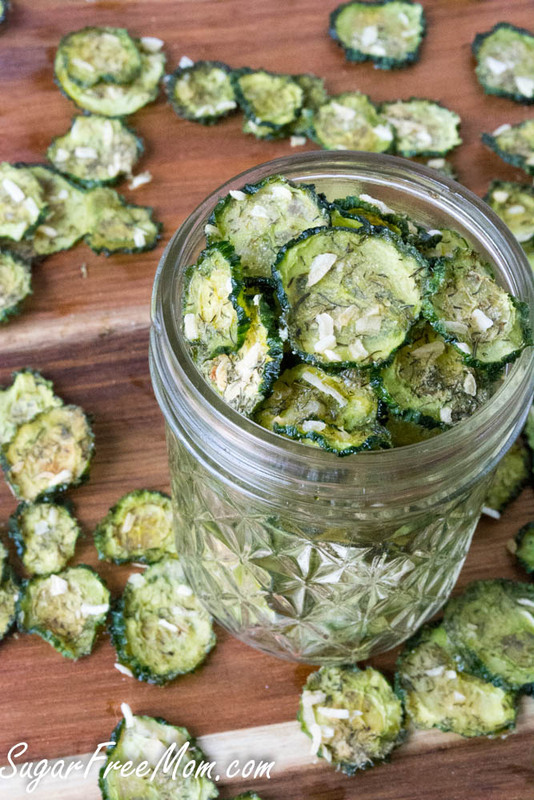 When I make substitutions like my Salt & Vinegar Zucchini Chips or my Homemade Ranch Zucchini Chips I can eat just a serving. They taste incredible and they don’t make feel the least bit guilty for enjoying them afterward. THAT my friends is progress. That is a balanced relationship. That is how want to live my life. 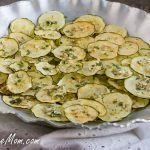 When I thought about a new idea flavor for a healthy chip, my kids and I were in the kitchen cutting up some mini English cucumbers for our lunch. Ah-Hah moment! 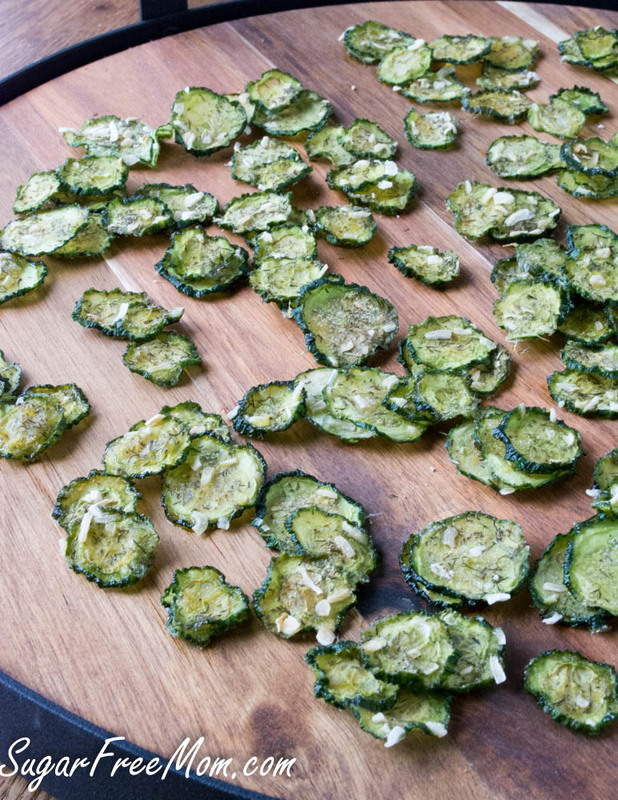 Why not make chips out of cucumbers instead of zucchini this time? I excitedly shared this with my children who all gave me a puzzled look of uncertainty. 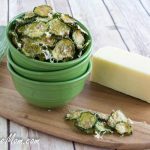 My daughter says she even likes these cucumber chips BETTER than the Zucchini ones! 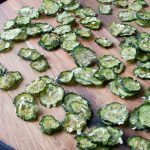 The boys still favor the Salt & Vinegar Zucchini Chips but said these are a close second! Either way, my kids are eating healthy chips and I love THAT! Coat sliced cucumber with olive oil and set aside. Whisk the rest of the ingredients together in a bowl. Lay the slices evenly onto the dehydrator shelves. Sprinkle dry mixture over the slices. Cover and dehydrate for 4- 6 hours. 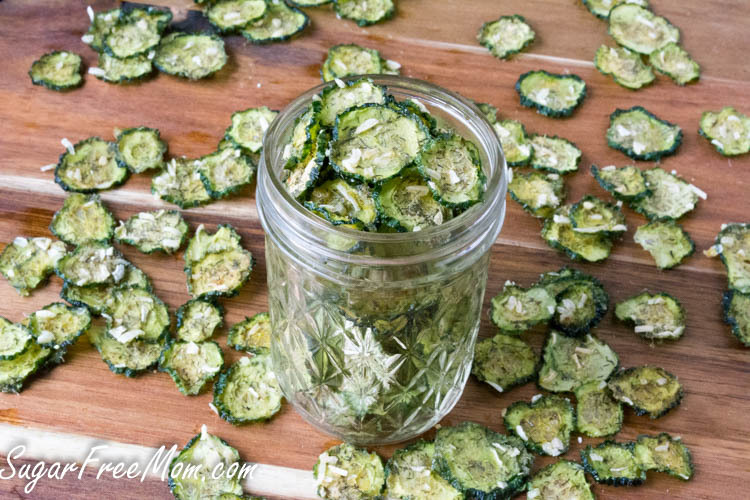 I really would love to start making the cucumber or zucchini chips. The only problem is, I don’t have a food dehydrator. Is there any alternative method without having to buy one? Thanks! You could try baking them at 200 degrees but not sure how long it would take. Let me know if you try it! Nice to meet you! I’ ashamed to say I never can anything, I really need to work on that! and pickling! I never pickle anything! Love to make my own pickles! Oh my is old and basic. Made by Ronco, doesn’t even have temperature settings. 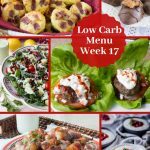 Can I use stevia instead of swerve ( don’t really know what swerve is) and if so, how much? Swerve is a mixture of Stevia & Erythritol that measures like sugar. You could use other Stevia products, I wouldn’t suggest Truvia as it’s slightly flavoured, and a lot of other’s use maltodextrin as a bulking agent which is made from GMO corn, so if you’re trying to avoid GMO’s or corn those aren’t suitable. Any suggestions on substitutes for the dairy ingredient? I’ve got two kids who can’t have that, and one can’t have egg, dairy, soy, OR nuts. Wow! If I could figure out a sub here for the buttermilk powder, I’d be all over this! I’ve got cukes in the fridge I could cut up right NOW! I can’t say I’ve ever seen a dairy free powder to sub, Sorry! Please let me know if you do find one! There is a coconut milk dry powder, Try the King Arthur Catalog or website. Oh thank you for letting me know! 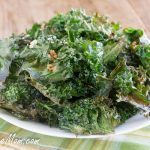 What about nutritional yeast – it won’t taste exactly like dairy but it is often used as a dairy sub. Also, you could play around fairly easily with the flavouring, and I bet it would still taste good without the buttermilk powder. For other types of recipes, cashews are often used as a dairy substitute – this won’t work if your other child can’t tolerate nuts in the house though. I’m not sure, haven’t tried that. If you do please let me know how it came out. Brenda, If I bake these on 200 deg. 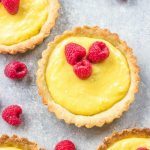 in the oven – how long do I need to let them bake? 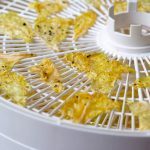 I would love to try them but I don’t have a food dehydrator. Might take 6-8 hrs, not sure has I haven’t tried these in my oven. can you tell me how thick you slice the cucumber? 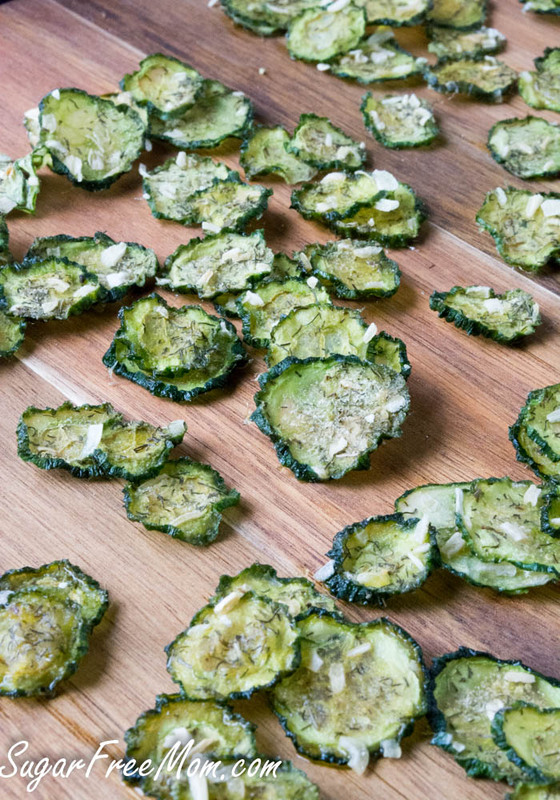 Do you line your dehydrator shelves with paper towels before you place the cucumbers? I tried these last night, and they all stuck to the shelves. I didn’t get chips, I got crumbs. The crumbs tasted good, but there’s got to be a way to keep them from sticking. I know I’ll need to set my mandolin to slice them a little thicker. Could that have been the problem? Thicker is better for the cucumber slices. I didn’t use any liners no, just spray or rub trays with olive oil maybe. Why do you need a sweetener at all? You can skip it if you prefer. First, your page is AMAZING & such a blessing! Our daughter is a Type 1 diabetic & celiac so finding low carb AND gluten free doesn’t always go hand in hand easily. Thank you for all of the incredible options! Do you know how these chips would do in an air fryer? Any tips would be appreciated. Thank you! 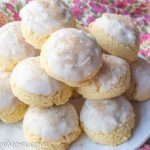 I don’t have an air fryer but I would love to know if you can make these in it. Please let me know if you try it. Hey! These sound tasty. Do they stay crunchy for a few days if you put them in a Ziploc bag? Or do they need to be eaten immediately. Thank you. We’ve never stored them, they were eaten but won’t stay crunchy in plastic bag. Try aluminum foil. I know I’m a couple years late to comment, but these are great. I mean really great. We had a leftover cucumber from our boys’ sushi night. 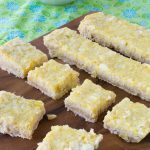 I had all the ingredients except the buttermilk powder so I substituted nutritional yeast. I wasn’t sure if I would like them but I couldn’t stop eating them! 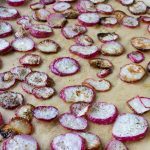 I basically ate them all straight from the dehydrator rack. Next time I’ll make more and cut the cuc’s diagonally so that the chips are bigger. But these were better than potato chips to me. These would be great for anyone who gardens and gets the 5-6 cucumbers at a time and is looking for creative uses. Thanks again for the recipe- truly exceptional. No you can use those cucumbers but they just have more seeds than English cucumbers so they might take longer to get crisp.